I feel it is really important to first talk a bit about the company themselves. I didn’t know a lot before I was sent the sling, but through talking to them and from reading their pages online I feel a real love for what they are doing and I think it is important to raise awareness. Bebe Sachi is very much a social enterprise. They invest in a small group of artisan hand weavers from Bangladesh and have single handedly managed to keep the weavers in occupation where most in their village have had to move away to find work. Bebe Sachi buys all that the weavers produce and everything that meets their strict standards goes on to become babywearing wraps. Bebe Sachi is most famous for their khadis … But I have been given the job of trying out one of their lesser known wraps, the Anggun (which means “a grace created in a dream”). There’s no way round it, this is a very thick wrap weighing in at 345 g/m2. It is really solid but not hard or too beastly. It is suprisingly soft for its thickness and will get even softer with use. It wraps really nicely. It’s grippy but not too grippy that it is hard to wrap with. Once on it is so comfy and supportive and was a pleasure wearing both Eden and Ezra. I feel it would be more suited for bigger kids because of its heavy nature but there’s no reason you couldn’t use it for a smaller child too. It looks really lovely on and I thought it was going to be a lot plainer than it is in real life. I was wrong though. It is really interesting and has a lovely bold pattern. The wrap came in a matching babywearing bag which was a really nice touch, but I that’s been stolen by Z. A small perk of having a husband who is wrap obvessed. I have one small negative and one huge positive to add. The negative is that it knots very big and this is a bit cumbersome and some may find this a problem for doing chest belts and candy canes if you are into that sort of thing like me. 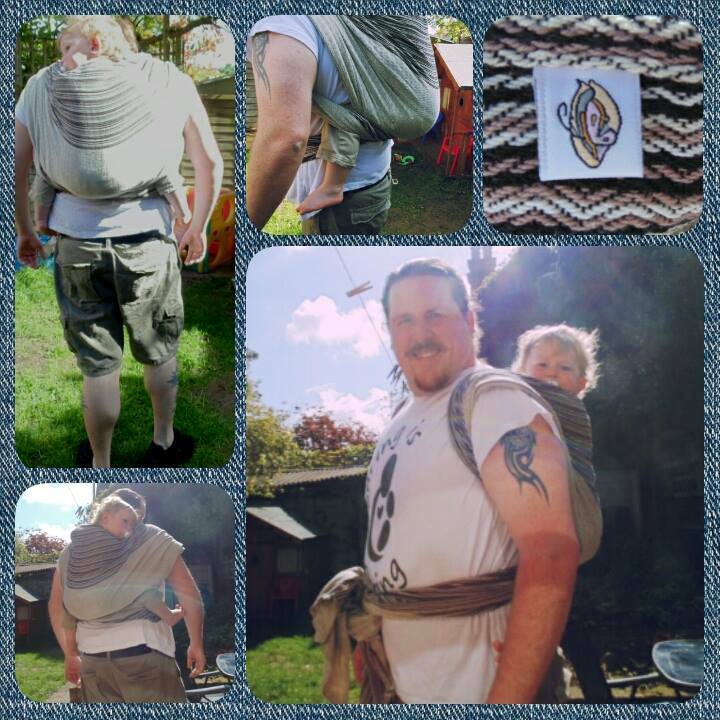 The positive is this … It is 76cm wide, the widest wrap I have ever used and I love that! I have always wanted to try a big wide wrap like this and I really love it now I have. The width is because of the handmade looms that are largely made from scraps that the weavers have found. Gotta love their make do attitude! For more information about Bebe Sachi and to see where you can buy their wonderful carriers check out these links.